The James R. Ludlow School, August 2010, is located on the SE corner of 6 Street & Master Street four blocks east of Yorktown. Yorktown is a neighborhood in North Philadelphia. It is located north of Poplar and west of Ludlow. The James R. Ludlow School and William H. Harrison School were listed on the National Register of Historic Places in 1988. 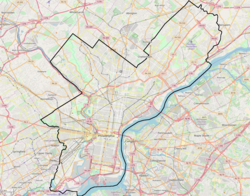 ^ "Philadelphia Neighborhoods". www.phila.gov. Retrieved 26 May 2017. This page was last edited on 28 October 2017, at 18:55 (UTC).